People change the device they are using an average of 21 times an hour when they are at home, according to findings from OMD UK's Future of Britain research project. The findings in the second phase of 'Future of Britain', OMD UK's year-long research project into the future of British consumer society, have prompted the media agency to back the Beattie McGuinness Bungay founder Trevor Beattie’s calls for shorter ads. A qualitative study of 200 people asked them to report which devices they used during one hour of an evening. The respondents used their mobile phones to record what devices they were using. On average, they switched between devices including mobile phones, tablets and laptops 21 times over the hour. Despite this, 95 per cent of people had the television on for the entire hour. Chris Worrell, an insight director at OMD, said: "We were quite surprised, and I think the respondents were surprised as well. Not only were they multitasking, but we were surprised at the sheer number of times that they were flip-flopping from one device to another. "Most people would have the TV on for the whole one-hour period, but they would then use their phone, then go to the laptop, then back to the phone, and so on." The research claims that mobile phones and tablets are "the 21st century equivalent of the kettle". 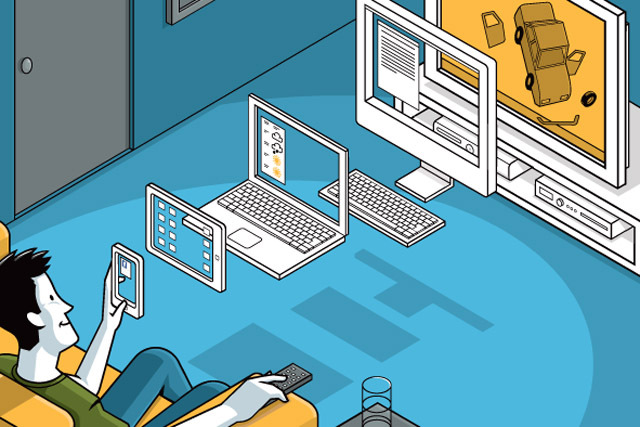 Before the presence of multiple devices in the home, it argues, people would make a cup of tea or coffee in television ad breaks, but now they opt to engage with other devices. Participants in the study included a woman aged over 45, who reported that she mostly used her phone while watching television, because she was "only half-heartedly watching the TV". One male aged between 30 and 34 commented: "I quite often have my smartphone or laptop while watching TV. If I am watching something that requires no attention or is a little boring, then I can play a game or go online." Worrell said the research emphasised that people were "always one reach away from distraction" at home, and called for advertisers to consider shorter ad formats than the traditional 30-second film. He said: "We think brands need to experiment with new formats that fit with these new consumption patterns. Things like skippable ads on YouTube are almost priming people to expect that after the first five seconds of an ad, you can choose to stay with it or move on. "That’s why we’re seeing such growth in sponsorship on television; it’s a new format that can engage with people in that kind of time period." The media devices research was part of 50 tasks set for the participants over ten days. Other areas of research included people's aspirations, their view of brands, their relationship with technology and their shopping habits. Are the days of the 30-second TV spot numbered?